What Program and Position is Right for you? EarthCorps has three Corps Programs: EarthCorps Crews, EarthCorps Volunteers, and EarthCorps Specialists. Take a look at the program overviews to see which one is the best fit for you! EarthCorps Crew is EarthCorps’ signature Conservation Corps program! 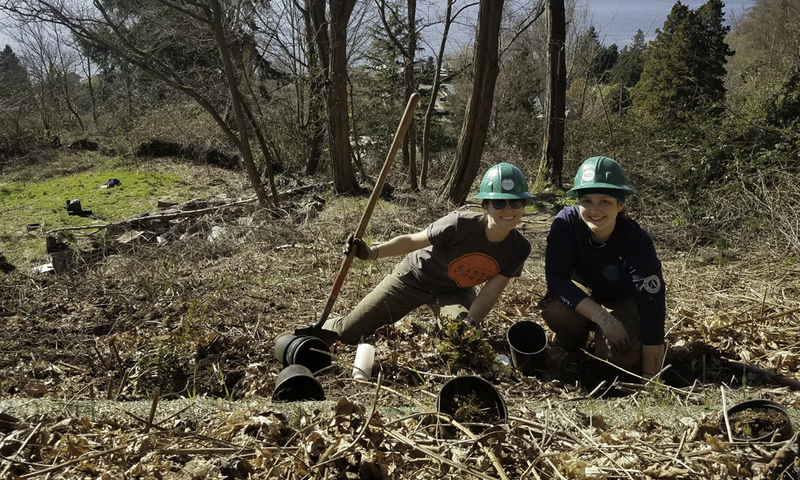 In the EarthCorps Crew program, you’ll be rolling up your sleeves to implement environmental restoration projects around Seattle and western Washington. The heart of the crew experience is working side-by-side and building a close-knit crew of 6-7 AmeriCorps and international participants. Crews work, camp, and learn together through the daily process of performing environmental restoration. It takes a lot of hard work, sweat, and happens outdoors in all kinds of weather. 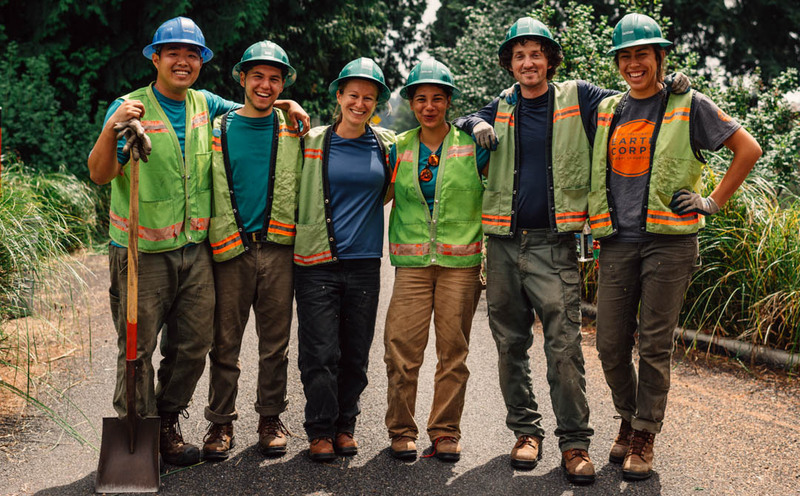 You’ll have the opportunity to work on a wide range of projects throughout the Puget Sound region, which may include invasive plant removal (both manual and through herbicide application), native plant installation, trail construction and maintenance, and stream and salmon habitat restoration. Projects take place in a variety of urban, suburban, and rural settings. Workdays are from 7:30 am – 5:00 pm, including some weekends. Service Learning /ˈsərvəs ˈlərniNG/ NOUN: An experiential education strategy that integrates meaningful community service with instruction and reflection. EarthCorps’ emphasis on service learning takes our conservation corps program to the next level. The EarthCorps Crew program devotes time to professional and personal growth through workshops and trainings that provide deeper context for the field work, as well as helping you explore your leadership potential. Topics include basic Pacific Northwest botany and ecology, environmental restoration theories and concepts, natural resource management, global environmental issues, and interpersonal and cross-cultural communication. You will also take part in two or three multi-day, off-site retreats. The AmeriCorps crew member positions run February through December each year. In addition to a monthly stipend, AmeriCorps members can earn an AmeriCorps Education Award after completion of the full program. Occasionally, short term positions become available throughout the year. Read a full position description from a past posting here: AmeriCorps Crew Member Position Description. See if EarthCorps is currently hiring for AmeriCorps Crew Members on our Apply Now page. The international crew member position is for non-U.S. residents to come and train in Seattle, Washington. It runs June through December each year. International crew members are sponsored by EarthCorps on a J-1 Trainee visa. EarthCorps charges no fees for international participants, however, participants are responsible for costs associated with applying for a visa and purchasing airfare to and from Seattle. International participants live with Host Families in Seattle who provide room and board and a glimpse into Pacific Northwest culture. Read a full position description from a past posting here: International Corps Member Position Description. For more information about what it’s like to be an international participant, please visit our Frequently Asked Questions page. See if EarthCorps is currently hiring for International Crew Members on our Apply Now page. Crew Leader is an AmeriCorps position that provides young adults who have previous restoration experience an opportunity to refine their leadership and habitat restoration skills. Crew leaders spend their days in the field with their crew, where they are responsible for the facilitation of crew safety and well-being, productivity, morale, and quality of work. Additionally, crew leaders will be coordinating projects between clients, EarthCorps project managers, and their crew. EarthCorps has a reputation for quality, hard work, and safety, and you’ll be expected to motivate your crew to reflect that reputation and have fun. Crew Leader position runs January through December is open to qualified individuals, both program alumni and outside applicants. Read a full position description from a past posting here: Crew Leader Position Description. See if EarthCorps is currently hiring for Crew Leaders on our Apply Now page. The EarthCorps Volunteer program is the branch of EarthCorps that engages the community in restoring our public lands. A team of five Volunteer Specialists, one Outreach Specialist, and three staff Project Managers lead 10,000 volunteers at more than 200 events each year! At EarthCorps volunteer events, we see firsthand how the act of working side-by-side to restore public lands brings people together. As a Volunteer Specialist or Outreach Specialist, you will participate in workshops including volunteer engagement, event planning and management, public speaking, and restoration best management practices. Volunteer Specialist is an AmeriCorps position that provides an opportunity for young adults who have restoration or service experience. They will refine their leadership skills through facilitating service learning experiences for volunteers. As a Volunteer Specialist, you will assist with all aspects of managing volunteer events, including: on site supervision and education of volunteers, maintenance of Volunteer Program tools and materials, and volunteer event planning. EarthCorps works with more than 10,000 volunteers over the course of a year, so as a volunteer specialist you’ll be the public face of EarthCorps. Volunteer specialist position runs January through December and is open to qualified individuals, both program alumni and outside applicants. Read a full position description from a past posting here: Volunteer Specialist Position Description. See if EarthCorps is currently hiring for Volunteer Specialists on our Apply Now page. Outreach Specialist is an AmeriCorps position that provides an opportunity for young adults who have restoration, service, or outreach experience. They will refine their leadership and communication skills through facilitating volunteer events and broadening EarthCorps’ reach to the community. The Outreach Specialist spends about half their time in a field setting assisting volunteer events through on site supervision and education of volunteers; and about half their time in an office setting where they help recruit and maintain relationships with volunteers. Outreach tasks include representing EarthCorps at various tabling events, assisting with social media, maintaining volunteer database, posting opportunities on various volunteer sites, and working with the Communications Manager to maintain consistent messaging about the organization and program. The Outreach Specialist works closely with Volunteer Specialists and participates in workshops with them. Outreach specialist positions runs January through December and is open to qualified individuals, both program alumni and outside applicants. Read a full position description from a past posting here: Outreach Specialist Position Description. See if EarthCorps is currently hiring for an Outreach Specialist on our Apply Now page. The EarthCorps Specialist program is EarthCorps’ newest program! The EarthCorps Specialist Program provides opportunities for young adults who have extensive habitat restoration field work experience. EarthCorps specialists gain leadership practice in project coordination, implementation, and logistics. The EarthCorps Specialist program is made up of Habitat Restoration Specialists, and Restoration Logistics Specialists. 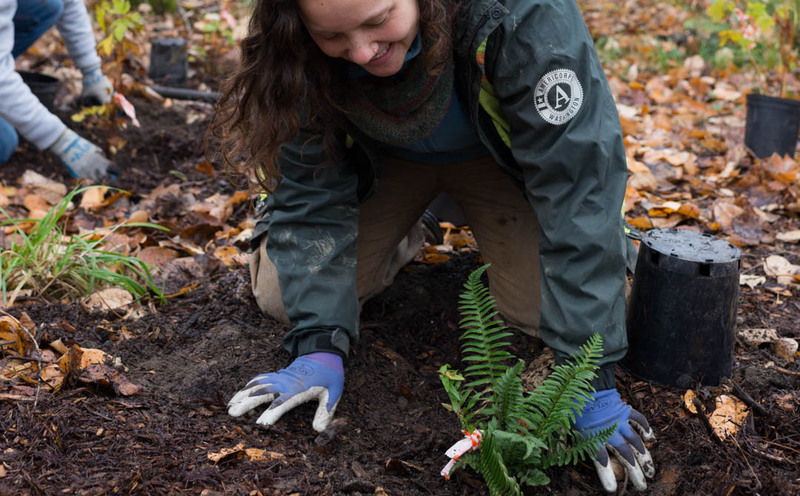 Habitat Restoration Specialist is an AmeriCorps position that plays a critical support role to our field service team by serving as a project assistant and occasional crew leader. As a Habitat Restoration Specialists, you will work closely with a Project Manager to coordinate and implement restoration Projects. Often the Habitat Restoration Specialists serve as on-site project leaders for EarthCorps, assist with monitoring and data collection, and foster and encourage leadership development among EarthCorps Crew Members. Habitat Restoration Specialist spend about 60% of their time in a field setting and participate in habitat restoration in all types of weather. See if EarthCorps is currently hiring for Habitat Restoration Specialists on our Apply Now page. Restoration Logistics Specialist is an AmeriCorps position that plays a critical support role to our field service team by ensuring that the habitat restoration crews have the tools and equipment necessary to accomplish project goals. As a Restoration Logistics Specialist, you will work closely with the Logistics Project Manager. 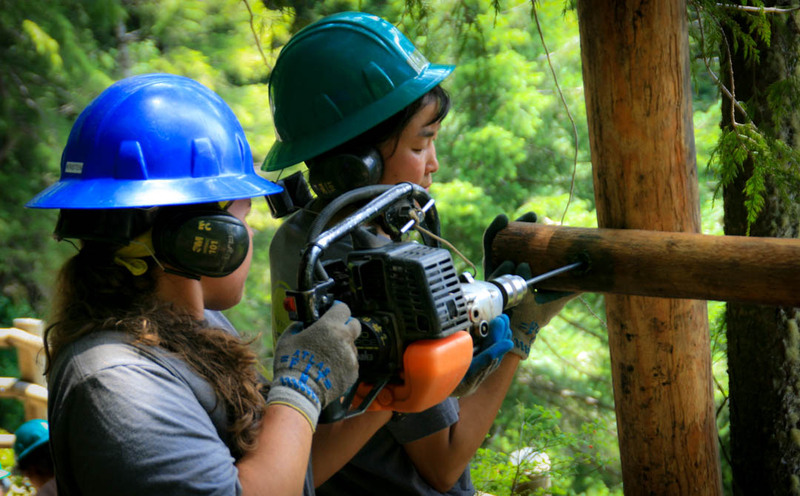 You will assist with the repairs and maintenance of hand tools, power tools, vehicles, and camp equipment, as well as purchasing food and materials in support of EarthCorps crews. Additionally, you will assist with coordinating and implementing habitat restoration projects and delivering materials to crews. The Restoration Logistics Specialist spends about 50% of their time in a field setting and participates in habitat restoration in all types of weather. See if EarthCorps is currently hiring for Restoration Logistics Specialists on our Apply Now page.